On the heels of "Dead Space's" successful debut last year, Electronic Arts has officially announced that the game series' storyline will continue with the creation of “Dead Space 2.” Hero Isaac Clarke will return to battle necromorphs with new weapons. Visceral Games will be producing the new saga, which had been rumored for months. A press release from EA says that survival won’t be the only thing on Isaac’s mind in "Dead Space 2" – "this time, he calls the shots." 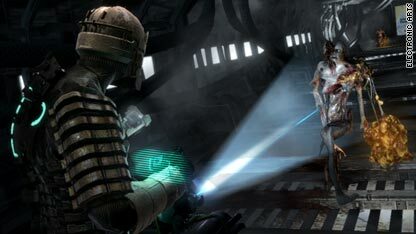 Released in October 2008, the original action-horror game won nearly 100 industry awards and received a score of 89 percent from gamerankings.com. Earlier this year EA released “Dead Space: Extraction”, a prequel story that was exclusive to Nintendo's Wii system in an effort to win over a new audience. “Dead Space 2” is being developed for the PS3, Xbox 360 and the PC. No release date has been announced. I really enjoyed the first Dead space and hope this sequel will match up to the first in terms of immersion and scaring the bejeezus out of you. The over all story is pretty interesting too, there is an animated prequel movie that was also pretty decent. Mind you, its NOT for kids none of this series should be anywhere near kids! If only they made it an MMO, then we could all be terrified...better yet make WoW a horror MMORPG then we could be terrified of playing it. This is one of the few games on any system that I would call "must play", especially if you like FPS. The game in not only scary as hell, but it isn't cheap jump out and get you scary... it's mood, atmosphere and amazing graphics. The sequel will be in my 360 on day 1 of release. This game is great. GREAT game for kids. BUY IT FOR YOUR KIDS. Younger the better. THEY WILL LOVE IT! Dead Space was so scary it freaked my XBOX 360 into the red ring of death!!!! Also the replacement one too!!! Bought it, Beat it, sold it. Missed it dearly, borrowed it. Had the shakes from withdrawal had to download after I seen it in the games on demand section of live and now I’m back on the Ishimura running around scared ”AGAIN”!!! It’s like it just doesn’t get old to me. I think as far as horror games goes this is the bar, and its set high. Oh and defiantly don’t play anywhere around kids. Or even in an earshot of a child. This game will scare you. I loved Dead Space cant beat the 1080p. loved the music the look and things jumping up at you when you think they are dead. Beat it to many times to count 20 + this game didn't get old. It was however quite short first time around taking plenty of time to play sub games and "look around" still cleared it in 14 hrs. now if it take more than 4-5 on a runn thru I'm upset. I will buy the next version and hope that it's longer and better than the first. Dead Space is the best game I've played IMHO, Unfortunatly I was only renting the game. I miss that game, and plan on buying this one as soon as it comes out! The game was good. It wasn't great, but the controls and the weapons made it very fun to play. Nothing like a magnetically suspended saw blade for doing bad things to your enemies involving their spleens. The game was not scary, though. Yea, I jumped once or twice, but I wasn't afraid like I was for Silent Hill or, worse, Fatal Frame. I hope they ramp up the atmosphere and use sound and suspense to better effect. Yea, I love the ability to destroy hoards of creatures, but that isn't what a horror game is about; I hope they scare me for real this time. It was extremely interesting for me to read that blog. Thanx for it. I like such topics and everything that is connected to this matter. I would like to read a bit more soon. It is very interesting for me to read that blog. Thanx for it. I like such themes and everything that is connected to this matter. I would like to read more on that blog soon. Great article. When will I get the rest details? I was wondering if you ever cosridened changing the layout of your site? Its very well written; I love what youve got to say. But maybe you could a little more in the way of content so people could connect with it better. Youve got an awful lot of text for only having 1 or two images. Maybe you could space it out better?